Sitting waiting at traffic lights, drivers have plenty of time to think. Most are likely preoccupied by an upcoming meeting, a child’s birthday or other daily details. Meanwhile, fuel is being burned and CO2 and other pollutants are spit into the atmosphere, impacting human and environmental health. The costs of this waste include the obvious personal expense and squandering of dwindling oil reserves (in the United States alone, backed-up traffic burns more than 10 billion litres of fuel per year). However, the human hours lost can also impact a country’s economic productivity, as evidenced by a report on the notorious congestion in Bangladesh’s capital that found workers there spent 3.2 million business hours stuck in their cars, biting nearly US$3 million out of the $100 million economy. As developing nations become ever more industrialized, these problems are set to worsen, as China’s recent epic 10-day traffic jam well illustrated. Thankfully, there are innovators out there who have considered this very question and are hoping to revolutionize traffic control. Their smart traffic light system will not only save fuel and cut emissions but the idea is to have drivers waiting less too. To get there, two researchers decided to think outside of the box. Dr. Stefan Lämmer at the Institute of Transport & Economics Dresden University of Technology and Professor Dirk Helbing of Swiss Federal Institute of Technology Zurich have been working to prove the assumption that lights should cycle green and red in a regular and predictable way is unnecessarily restrictive. Less orderly patterns, they say, would be more efficient. What’s more, they argue in a recently published paper, is that to achieve these new less uniform patterns, the lights should be left to organize themselves, by coordinating with each other! (In case you never wondered how or why lights change when they do, traffic engineers normally set the cyclic operation of signals to match recent past traffic patterns — e.g., lights on main roads stay green longer during peak hours). Back a few years ago, Lämmer and Helbing hypothesized that, if given some simple traffic-responsive operating rules and allowed to set their own red-green switching, ‘smartened’ traffic light systems could devise more efficient solutions to the pressures of vehicular congestion. The team then modelled the flow of traffic and explored what happens at road intersections where traffic leaving one road has to enter another, similar to how fluid moves through a network of pipes, or a moving crowd will flow around an obstacle. Of course jams can arise if traffic entering a road overloads its capacity. To mitigate this, the scientists equipped each set of lights with sensors that input information about the traffic conditions at a given moment into a computer chip that then calculates the flow of cars expected in the near future. Based on the number of vehicles, the chip also works out how long the lights should stay green in order to clear the road and relieve any congestion. This way, each set of lights can estimate for itself how best to adapt to the conditions expected. Smart as the lights were however, Lämmer and Helbing discovered that they sometimes adapted too much. If focusing only on local conditions, a light can stay green for too long and cause trouble at other lights further away. No worries however: the team’s latest coup was to come up with a “decentralized stabilization mechanism” so that what happens at one set of traffic lights would influence how the others respond. By monitoring the lengths of queues forming on different stretches of road, a linked-up ‘hive’ of lights works together to prevent long jams from forming. The key to their new type of control is that it does not ignore natural fluctuations in the traffic flow by trying to impose a certain rhythm. In other words, there is no “green wave”, where one intersection after another receives a green signal, despite the lack of cars waiting. Rather, Helbing and Lämmer’s system uses randomly appearing gaps in the flow to give the green where it’s needed. “No driver waits for no reason. There is no chance that traffic lights give a green light to empty streets while others are queued. That minimizes frustration,” Dr. Lämmer told us by e-mail last week. Aside from reducing driver irritation, the system’s overall effectiveness is notable. In tests based on the road layout of the city centre of Dresden in Germany, Lämmer and Helbing had “very encouraging results”. And that was on a challenging network of roads that included 13 traffic-light-controlled intersections. The team chose this particular spot because it is known for delays and “notorious coordination problems” despite the use of state-of-the-art-control. Bus and tram lines crisscross the area and 68 pedestrian crossings lie within it. Their new coordinated flexible self-controlling model reduced all wait times, but public transport was the winner, seeing the time buses and trams were stopped at red lights slashed by 56 %. Pedestrians’ wait to cross intersections fell by 36% and cars and trucks 9%. “Local traffic authorities and other experts have been very impressed by the superior performance of our solution, since we could show how to make public transport faster and more reliable without slowing down car traffic,” Lämmer said. Early adopters of this green solution could perhaps end up being one of the world’s famously congested cities like Beijing or Dhaka. “From our simulation studies we learned that our traffic light control is particularly well suited, as compared to conventional state-of-the-art controls, in situations where traffic is heterogeneous (different modes of transport), where traffic demand is high, and where the network layout is irregular. In these situations, green-wave-based approaches are almost impossible to implement,” Lämmer explained. So commuters the world over, will some day, hopefully soon, be thanking Lämmer and Helbing for giving them back some of that lost time and easing any road rage. In terms of emission reduction strategies, town planners should take note. Further in the future, reduction of the waste and waits caused by traffic will have even more advanced solutions. Professor Helbing put us in touch with a colleague, also from Dresden University of Technology like Dr. Lämmer, who told us about another branch of traffic science in which they are working together: intervehicle communication (IVC) technology. “You can think of IVC similar to a WLAN/WiFi connection: a short-ranged broadcast-type communication to other vehicles (car to car) or to stationary devices of the infrastructure (car to infrastructure) such as traffic lights or so-called roadside units,” explained Dr. Martin Treiber. This kind of communication, hooked up to in-car driver-assistance components, will apparently be part of the “intelligent traffic systems” of the future. “We have investigated and simulated several concepts, such as a decentralized real-time jam-warning system, a ‘traffic adaptive’ cruise control system to make traffic flow more efficiently, and infrastructure to car communication from traffic lights,” Treiber said. Imagine: your car could simply cruise you away from the jams and find you a better route by instantaneously chatting with other cars and smart light posts. Isn’t it nice to think that some day traffic jams may no longer exist at all? Green idea: self-organizing traffic signals by Carol Smith is licensed under a Creative Commons Attribution-NoDerivs 3.0 Unported License. What a godsend this would be if it were widely implemented. Or, for that matter, even narrowly implemented, so long as it is done along my commuting route I take three days a week. Nothing beats those other two days when I can work from home, but driving through San Francisco’s endless blocks of stop-and-go on my way to and from the Golden Gate Bridge would be much less burdensome if the traffic lights were self-organized. Not only would moods be lifted, but so would fuel economy. Thanks, Carol, for helping give the, er, green light to such a worthy technical fix! 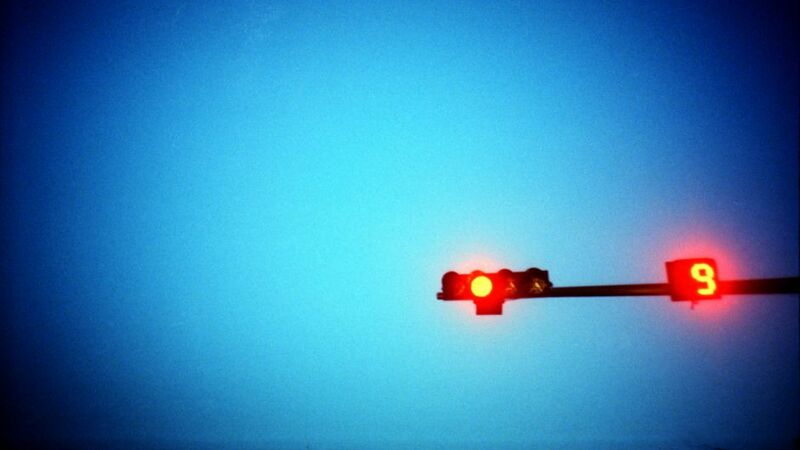 Waiting at a red light for nothing….